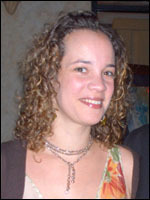 Michele Pierce Burns is a consultant, fundraiser, writer, and public speaker focusing on autism awareness and acceptance. She works part-time for Celebrate the Children, a State-Approved School for Children with Alternative Learning Styles in Wharton, NJ. She is the proud mother of Danson Mandela Wambua, age 9, and has recently co- written a book with him entitled DANSON: The Extraordinary Discovery of an Autistic Child's Innermost Thoughts and Feelings (St. Lynn's Press, April 2009). Michele is currently collaborating with Illustrator Louis Henry Mitchell (Senior Character Designer and Creative Director at Sesame Workshop) on a second book for Danson entitled I Love Everything About You which affirms the belief that every child with autism is a perfect blessing exactly as he or she is (St. Lynn's Press, Spring 2010). Michele and Danson have been featured on OPRAH, The Today Show, Larry King Live, and in the documentary Autism Every Day which premiered at the Sundance Film Festival in 2007. Michele volunteers and consults at: Sesame Workshop Healthy Habits for Life and Autism Awareness Project, as a member of the family services committee at Autism Speaks, HALO (Helping Autism through Learning and Outreach), Seeds of Hope Outreach in Southern Africa (dedicated to bringing services and hope to orphans due to AIDS), and at Connor's House, a home-like community for family-centered care for children with complex health needs. Previously, Michele was a high school English teacher and co-founded two college preparatory-based charter schools and a summer academy. She holds a B.A. from Wesleyan University (English/Afro-American Studies), a M.A. from Stanford University (Education), and a M.Ed. from Harvard University (Administration, Planning, and Social Policy).She is a certified Yoga and Yoga for the Special Child teacher and a Reiki Master. She is so grateful to share her daily life with Danson and her beautiful husband Michael. It is rare that any of us meets someone that we are instantly drawn to admire. Michele Pierce Burns is one of those people that provided that rare experience for me. Her love of and her commitment to her son Danson, her passionate stand about the work she does on behalf of children living with autism and her honesty about what it takes to live that commitment and to generate that passion everyday, inspires me to challenge myself about what is possible. DR: Tell me about your life with Danson. MPB: Danson is my greatest teacher. He is a brilliant and complex and a sweet and loving child. Although he would say "young man" since he is about to be ten. He is just incredible and, he is incredibly courageous in the way that he pushes through his natural tendencies toward isolation and non-communication because he has very little verbal language. He is labeled as non-verbal but I never use that term for him because he tries to talk all day long, every day and that term does not acknowledge the tremendous effort that he makes. He does say words. They may not be understood by many people but, in context, we do understand what he is trying to say. Because he has very little verbal language and because of his sensory overload all of the time, with sounds and filtering out voices and the things he may hear externally or things that we can not even detect, the world is kind of a scary and overwhelming place for him. I say that he is absolutely my hero. He is so courageous because everyday he just goes out there and he keeps trying to connect with people. "Holy stories with the world". "How is one little life supposed to turn the world to love when there is so much suffering". "I want to go to Darfur to help". He is pretty amazing that way. His heart is huge. DR: How did the book come about? Today we walked by the lake right before sunset holding hands. When we returned to the car, I asked Danson what was on his mind. In the poem that follows, the reference to "Papa" is my beloved father, Burton Armstrong Pierce (August 24, 1929-July 31, 1999). I had shared with Danson in the past that some of my most treasured possessions are letters my father wrote to me throughout my life, and I write letters to Danson on his birthday and at other important times. Lisa is Danson's phenomenal teacher at Celebrate the Children School. I alive with writing and half free from autism gladly. I luckily flunk all flavors of autism. Because she always knew I would laugh again. And living a long life worthy of God. And having a grass pool. Keep talking about it with love in our hearts. So I might say thanks, Lisa, for today-loving, laughing, seeing me.. But I give no hints to how I really feel. And I made another baby Abraham. And I see it and get mad in my head. I need to give my truth now. I have no laughter in my soal [soul]. And it is not good in life. When there is so much suffering? I do not know how to do it by myself. Teach me about feelings and I will learn how to talk. I need to hear my name in a lot of places like the blind need to see. Mom, I need to have slow motor life like when I was a baby. My room is slow motor and I like it in there. And have love in your heart. Give me space to think about my life. Slow motor is so right for humans. MPB: Danson wrote his first word about two years ago. Before that he did not communicate at all. When he began writing he was with his extraordinary therapist and teacher, Soma Mukopadhyay. She is out of Austin, Texas and has worked with thousands of children around the world utilizing a method in which the children point at an alphabet board and spell words. Ultimately they will learn move from the alphabet board to handwriting independently if they choose. Danson began when he was seven and a half years old. The first time we took him the school we were astounded. We were there for a week, and to learn that all along, his whole life, he was taking in everything... He knew how to multiply. He knew about political topics and current events! It blew our minds. It started out simply, with him writing one or two words at a time. Soma asked him what he wanted for his birthday and he said "Jeans and an iPod". We said "What! He's an 8 year old kid! ", which we always knew but, to have the feedback from him that he was in fact retaining and understanding, was just incredible. I went home so motivated. We home schooled him for a couple of years and we began doing these lessons everyday just like Soma taught us. We would read an academic text of some type and then ask Danson questions about it. It was hard at first. I felt like I didn't know what I was doing and I didn't understand how to engage him. I just wanted to move to Austin, Texas and let him sit with Soma all day. Then, one day, a few months into it, a breakthrough happened and he just started writing. DR: Is he physically doing his own writing? MPB: Well, when he first started back then he was pointing to letters on an alphabet board and I would sit and transcribe everything that he was writing. It was amazing. We would do it a lot in the car because he loves being in the car. We would often go to a park to go for a hike or a walk and then we would come back to the car and do his work. It was very intense and a lot of days he would fight. I mean literally fight because it was so challenging or he wasn't able to do it or he because couldn't make his mind and his body connect so that he could say the things that he wanted to say. It was really challenging. I almost gave up a million times but I didn't. I feel that he is my purpose for being here. "Thank God for Dad, Mom, because if it were left up to you I would have never played when I was little." What was it like in those moments when you felt like giving up but then you didn't? MPB: Honestly, I feel like I have been to hell and back and its not even over. You have no idea what to expect on any given day. I had to lose my whole identity and start all over again. That is how I felt. It has been a blessing and what I feel like is that I am starting for the first time to understand the really simple things in life and what really matters. I used to be an educator. I used to start schools and summer academies and I really, really loved teaching so it was really ironic to have this child who I had no idea how to connect with at all. Back then I was kind of living my life long dream-- running a school in the Bronx that I had co-founded. I loved it very much. But, through all of this I realized that I could not be at peace with myself with three hundred other children and not be addressing the needs of my own child. I would look down and realize I was in my pajamas. I feel like I have been so immersed in the world of autism myself that I have been out of touch with day-to-day life during this journey. "Oh my gosh! All I have done over these past four years is demonstrate patience!" I think that on the days that I can laugh and really listen to him, I feel humbled and honored to be his mom and I can be really forgiving to myself on the days when I am impatient. It happens a couple of times a year that I will just totally lose it because I am so stressed and because it's so exhausting and because its so 24/7. Then I'll weep hysterically. But, Danson is incredibly forgiving and resilient and loving beyond anyone I have ever come across. DR: Do you have a memory of a particular moment that you would consider a break through? It was a grey, foggy, cold and rainy day and the two of us were out walking by this lake that Danson likes. He was kind of running ahead of me and I was praying with tears in my eyes because I was thinking as I watched him run, how I wish he could just run free-ever--and not have to hold somebody's hand or not have somebody chasing him. Watching him do that somehow that day and running to keep up with him made me feel sad. At that time I didn't know how to reach him. I knew that there was all of this inside of him but I didn't know how to get it out. "Okay God. Just give me something. Let me know that it matters at all." "I saw a man in plain life turning stars into gold for Mom. It was God because he loves you." DR: And that was something that he wrote while he was pointing out the letters to you? DR: So that was unfolding for you? It took about a half an hour for him to spell that out. He just sat there pointing and pointing at all of those letters. MPB: I don't have a word to communicate what that was like but those are the moments that really keep me going because I know now that is what is inside of him. He has so much to say. He has so many questions. He is just incredible and just because he can not open his mouth and say things in the way that most people say things, doesn't mean that he doesn't have all of those things to say and more. DR: Is this unusual, Michele, because to me Danson sounds exceptional? But I am not living in the world of autism so I'm not sure. Do you find that Danson's ability to communicate so deeply is common? Everyone with autism is unique and what I do find is that lots of kids have things to say. As I see it, they have a lot to say because it is almost like being in a constant state of meditation because they never say anything. All they have is their thoughts. Everything that happens to Danson is inside of his head and he talks about liking it that way. That is one of the hardest things about his autism. He says that there are parts of it he loves and he doesn't want to be out in this world. He likes his world a lot. DR: What do you think that he thinks about the fact that you are his mom? MPB: On a day-to-day basis I think he is extremely frustrated. He told his dad that he thought I was overbearing. I think that is hilarious because I am in his face all of the time and, I agree. I am an intense person and I have turned my intense focus on him, so much that, if I were him, I would feel like I am overbearing too. He has written some awesome things about his love for me. He wrote something one day when he was talking about how he wanted me to start a school for him. I was telling him what a really big deal that was and that if he helped us figure out what it is that he wants, we would help him figure it out. He gets really angry and frustrated and might even hit himself until he is bruised because of this angst that I think has to do with being frustrated because we have made all the decisions for him his whole life, because we have never had his input on anything. "I know that has been hard for you. Whether you want to go to the bathroom or not or what school you want to go to." "You have to communicate with us because we don't ever want to make decisions for you again like you don't have a say." "Mom, you are the right mom for me." MPB: I put that up on my wall and I look at it every day. I would never have stopped. When I was pregnant with Danson I was in a Doctoral program at Harvard in education. I had plans to build these great schools. My whole life I knew that I wanted to be a teacher and start schools. I would never have stopped. What I do now, besides being with Danson? I just became a Reiki master last week and I am also yoga instructor. I feel like I have made these wonderful choices in my life because I have started to slow down. Because of him I have tried to figure out how I can show up as a healing presence for others. Danson is a collection of 50 poems by an 8-year-old non-verbal autistic boy, Danson Wambua, with commentary by his mother Michele. This book comes at a moment of intense public focus on the mysteries of autism. For the families of over a million autistic children, Danson's poems offer hope and illumination. Imprisoned by his autism for the first 7 years of his life alternately frustrated, angry and loving Danson suddenly begins to speak, pointing to letters on an alphabet board. What he reveals in his extraordinary conversations with his mother Michele, is the complex inner world of autism. Danson is a gifted child-poet (reminiscent of Mattie Stepanek) who writes with insight, intelligence and spiritual depth. 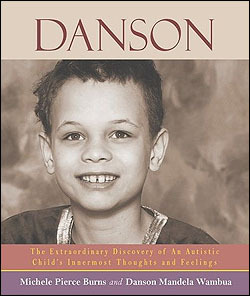 9-year old Danson's book is an inspiration to many, including Suzanne Wright, Co-Founder Autism Speaks who says "What you will discover, as I did, is truly and undeniably astounding!,' Bill Cosby who says "Danson is more than a prophet--he is what this world needs--this is the voice that is going to change the lives of all children in need." and Susan L. Taylor who says "Danson is a modern-day Rumi. His writing is stunning and beautiful, like his person."